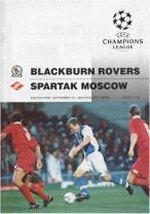 Blackburn qualified for the Champions League after finishing as Premier League champions in 1994/95. Blackburn finished bottom of the Group and were eliminated from Europe. Full Group results and table.